Keep Your Eyes On The Road.......If You Can! 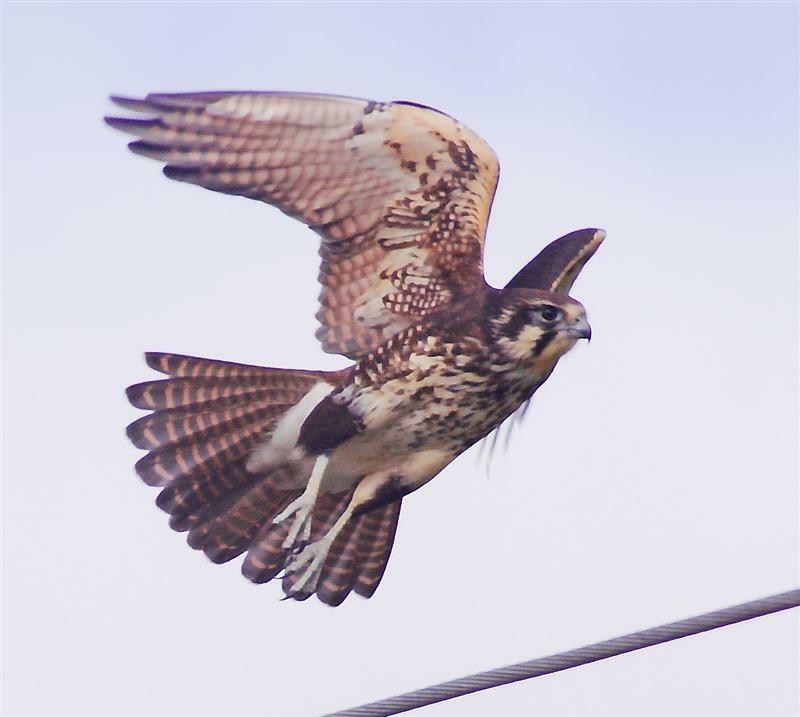 One of the highlights of driving round at this time of year (if you're a birder) is the large number of birds that hunt from perches in the open, often power lines. 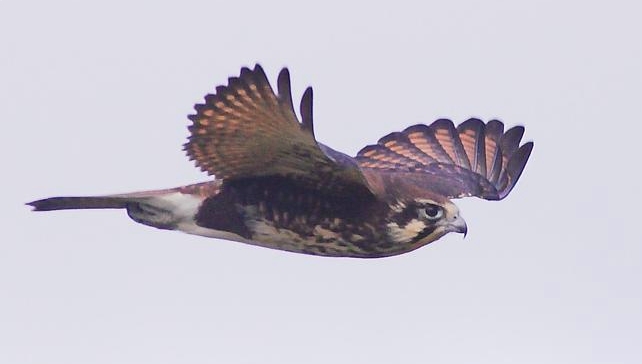 On Tuesday a drive round the Cambridge/Sorell area, produced about 10 sightings of Brown Falcons, and I took the accompanying images of one of them, as it launched itself in pursuit of some Goldfinches--it was unsuccessful. Actually, the most common powerline "sitter" at the moment, is undoubtedly the Kookaburra. I counted at least two dozen, mostly loosely grouped in 2s and 3s. I didn't attempt to photograph them, maybe another day. 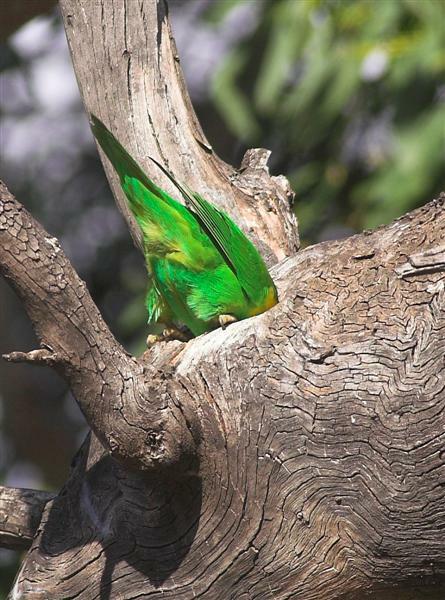 About a week ago I noticed a pair of Musk Lorikeets taking more than a passing interest in a hole in a eucalypt while on my "constituitional" round the neighbourhood of Bellerive. Over the weekend I was surprised to see them again at the same spot and watched and took the accompanying photos.. The eucalypt is in the coastal reserve behind Bellerive Beach, and the hole is in a dead branch some 6 metres above a car park. They appeared to be cleaning the cavity out. I know little about the breeding cycle of Musks, but I would be surprised if they bred before Spring. Do they normally stake a claim to a possible site some months before they breed? Or perhaps there is some other explanation about what they were doing. They both spent many minutes within the hole and these shots were taken just before midday. 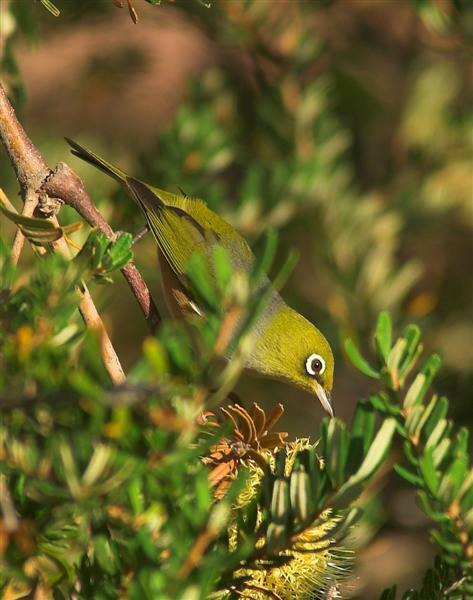 Do you have a birding spot that whenever you approach it you get that great feeling of anticipation and excitement? Well over the years I've come to feel that way about the bridge over the Orielton Creek at the North end of Orielton Lagoon. The old bridge, a rickety, single lane wooden one, has been replaced with a concrete and steel 2 lane job. Perhaps it doesn't have the charm of the old one, but makes for easier viewing from the car! Over the years, from this bridge, I've seen such Tasmanian rarities as Marsh Sandpiper and Oriental Plover, and a battle between a Coot and a Sea Eagle, that went on for 10 minutes or more , before the Sea Eagle gave up. Those halcyon days, I suspect, are gone, due in part to the regime of the lagoon now making it tidal. Undoubtedly, the ever burgeoning Kelp Gull colony, is also having a detrimental effect. Despite that, it's still one of the best spots to see Egrets, Pelicans, Terns, Gulls, and a host of small waders, all without getting out of the car! 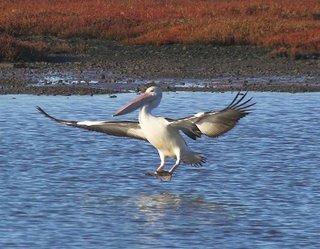 The accompanying images of a Pelican and Little Egret were both taken from the bridge earlier this month--and I did have to get out of the car to take them! John & ShirleyTongue write: We had a very productive day's birding on Thursday, with 65 species recorded, including one new to our Tassie list (Rainbow Lorikeet). 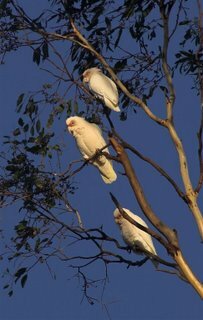 We also saw a couple that we've only rarely seen here--Australian Hobby and Royal Spoonbill. The total was given a flying start at the large dam at the Forcett Lakes Golf Course. Walking around this dam we recorded 41 species on it, or nearby. 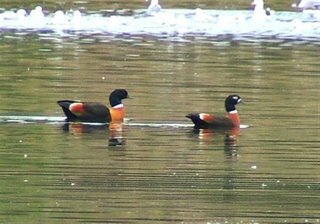 This included at least 28 Australian Shelduck (see accompanying photo). We are not used to seeing such large numbers in the South of the state. 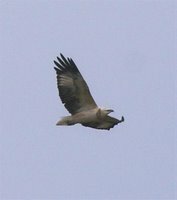 Over 20 came soaring in together, swaying and circling, with very noisy wings. (Ed. I think this is known as "whiffling") One of them appeared aberrant in colouring, unless it was a juvenile. However, none of our books listed this colour pattern for juveniles. It seemed just like the rest, only it had a buff coloured chest, instead of the normal rich chestnut. 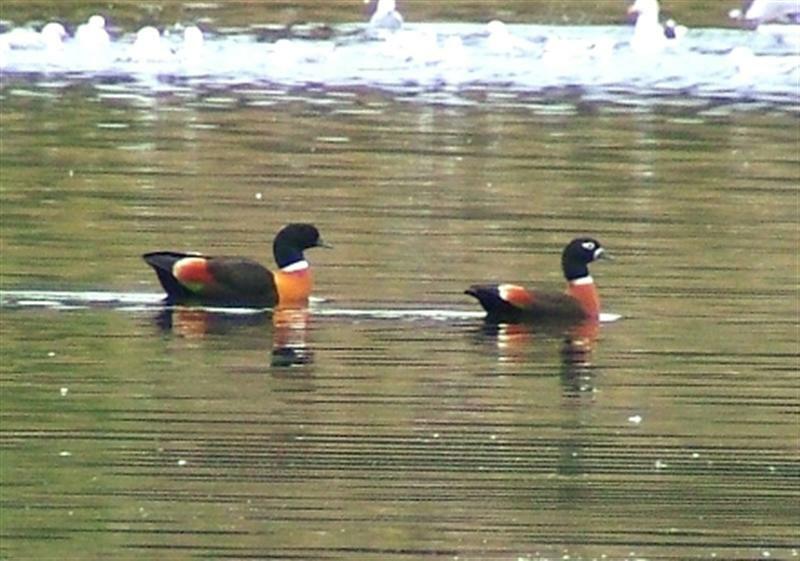 Sadly, it was too distant to get a decent photo.. Has anyone else seen Shelducks with this colouring? 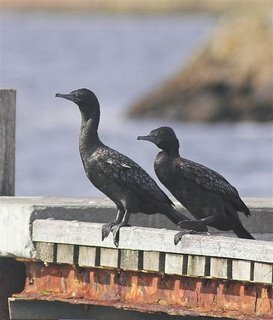 Excepting the Pied Cormorant, which is a rarely seen species in Tasmania, the scarcest cormorant here is the Little Black. 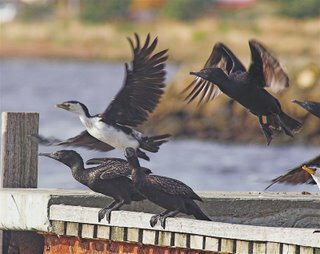 I suspect it's often overlooked, particularly when roosting with other cormorants. 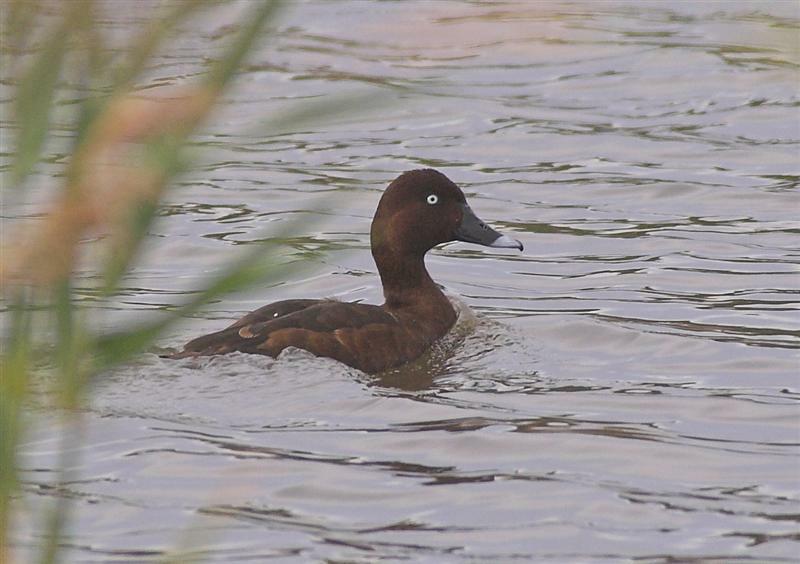 Most often seen in estuaries, although sometimes found on larger farm dams. 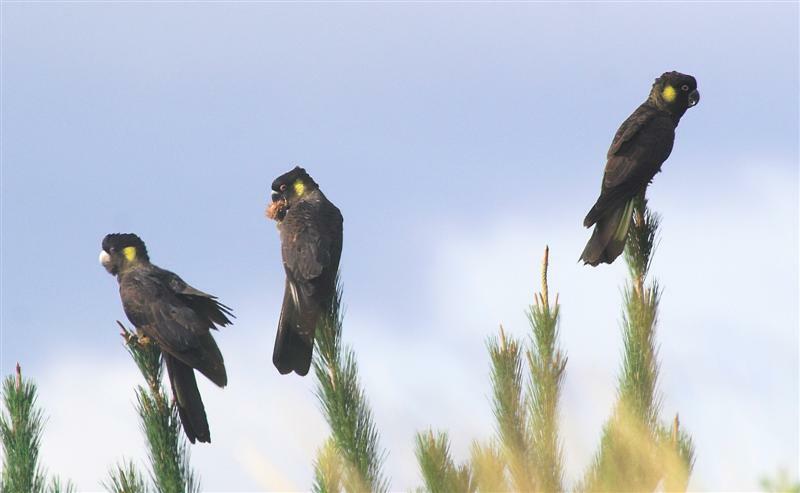 Around the Hobart area, there are usually small groups to be found in the Derwent Marshes, roosting on the beached dead trees. 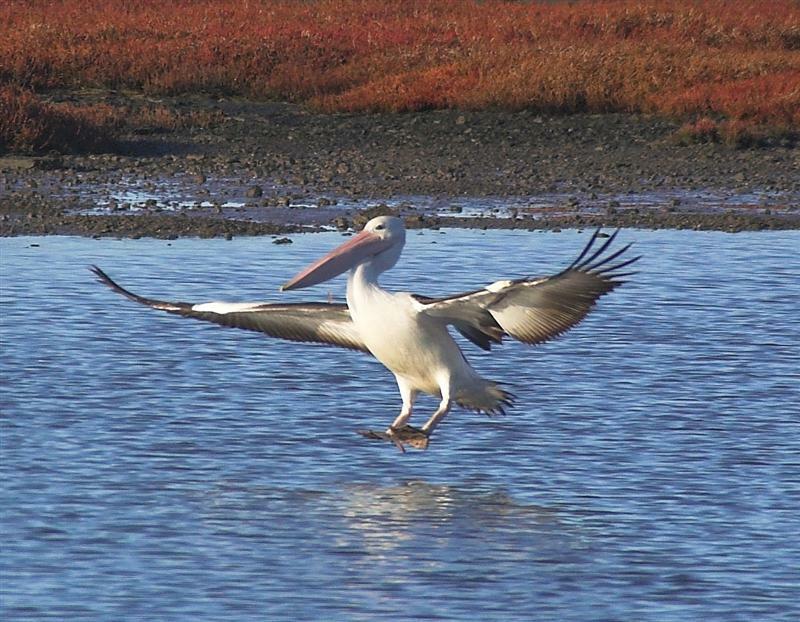 Other sites include Blackman Bay (Dunalley area), where occasionally flocks reach around 70 birds. 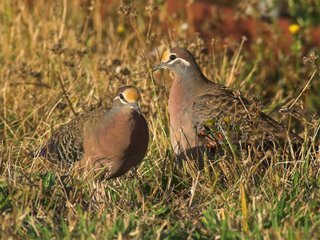 I'm sure they don't usually generate great excitement among birders, but perhaps you haven't seen them cooperatively feeding. I've witnessed this feeding method at close hand a few times, and their ability to "herd" fish and the subsequent feeding frenzy, makes for exciting viewing. Occasionally, Little Pied and Great Cormorant join in. 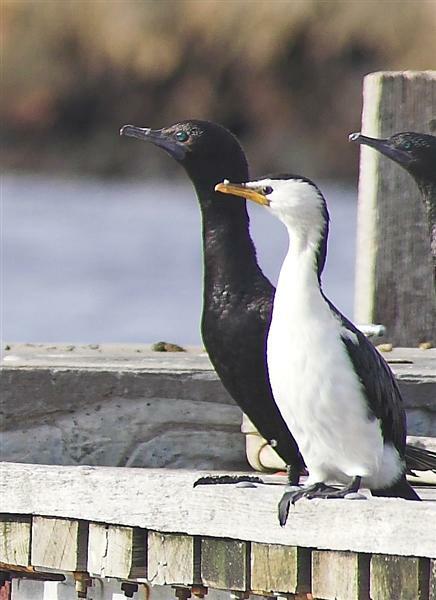 The images shown here, were taken at Montrose Bay (on the Derwent River) recently, on the yacht club jetty. 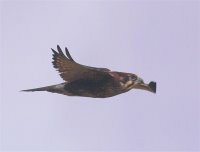 One of the shots gives a comparison of size with a Little Pied. 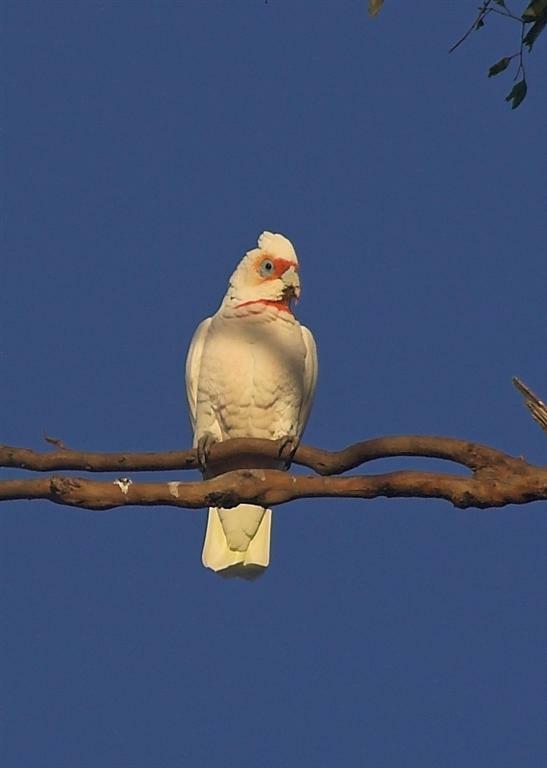 I was on my way to Maydena this morning when I came upon one of the Sulphur-crested Cockatoo flocks, this one at Plenty (just North of New Norfolk). The flock numbered around 400, I would guess, and was spread out over several kilometres. 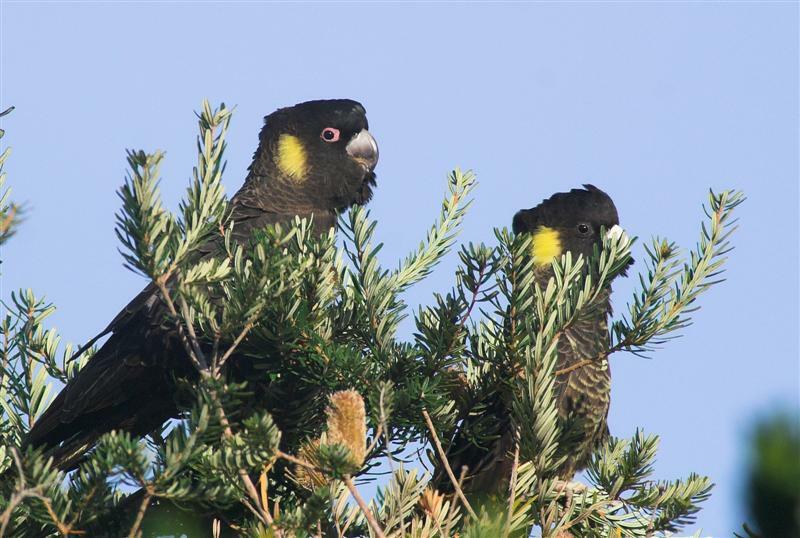 I stopped to photograph a group in tall eucalypts close to the road--surprised they let me get that close! I then realised that among the Sulphur-crested were a 'sub flock' of about a dozen Long-billed Corellas. I think this is the first time I've had more than a fleeting, distant view of them in Tasmania. I gather they have had a substantial increa se in population in Victoria, and are well established in the Northern Midlands of Tasmania. 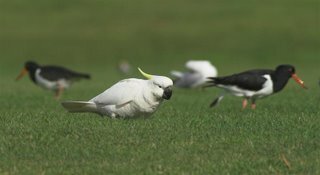 Probably closer inspection of Sulphur-crested flocks will throw up more records. I didn't get a count of the total numbers of Corella, but saw at least 20. 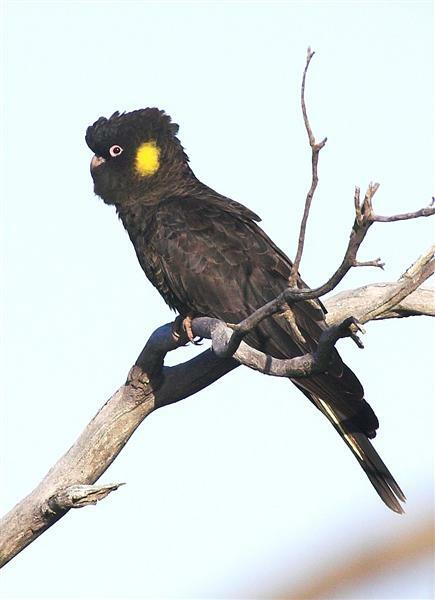 While the colloquial expression about a "cockatoo" (a lookout at an illegal 2-up game), properly refers to the Sulphur-crested Cockatoo, it could equally apply to the Yellow-tailed Black Cockatoo, if my experience in trying to get close to the 40+ birds in the South Arm Reserve is any gauge. 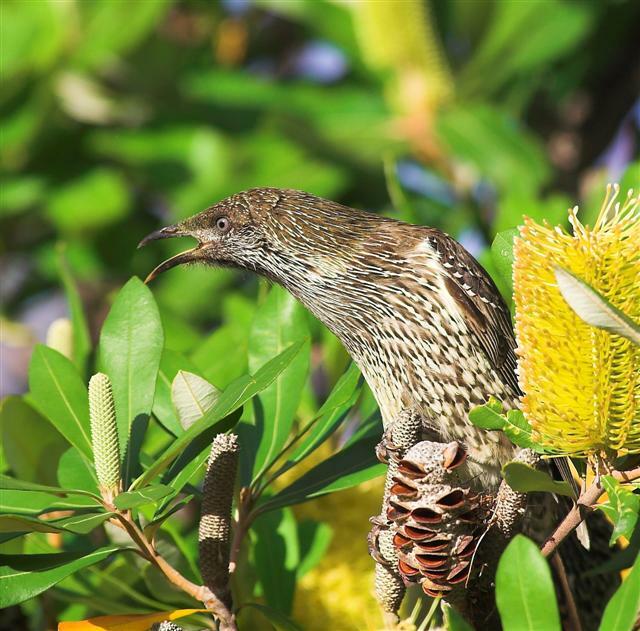 Despite their 600mm+ length, they are surprisingly difficult to find among the Banksia heath country, and if they choose to remain silent, they'll probably find you first! 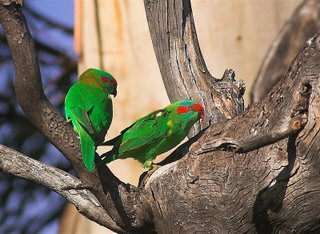 I did get in among a flock while they were feeding in among some trees (difficult to photograph), I was interested just listening to the "conversations" they appeared to be having, including a "laugh", somewhat reminiscient of part of the Kookaburras call. I hadn't heard that before. In flight they are magnificent. 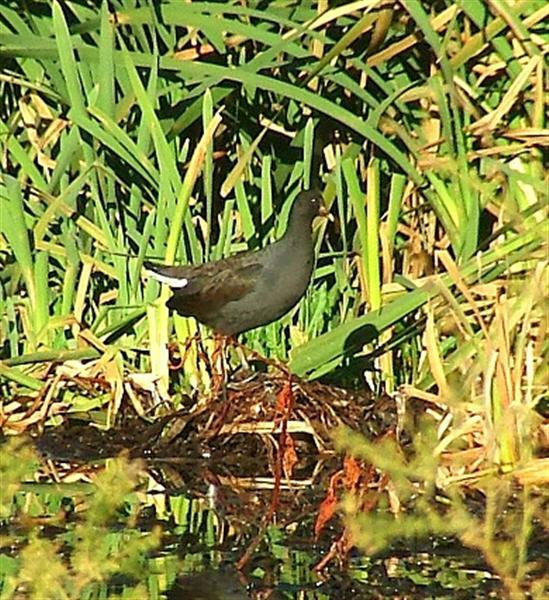 John & Shirley Tongue write: We don't often come across Dusky Moorhen in Tassie--though I hear they are consolidating and expanding their range. 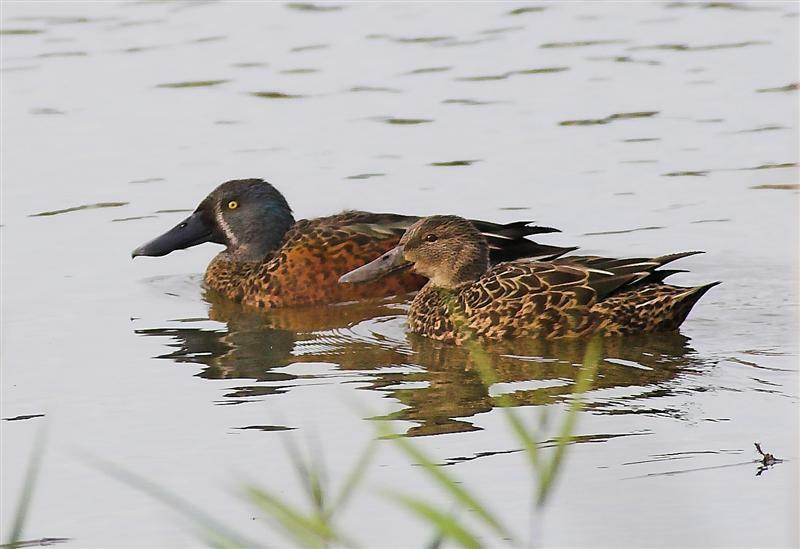 One exception is at the New Norfolk Sewerage Treatment wetlands, where we have seen them a couple of times. 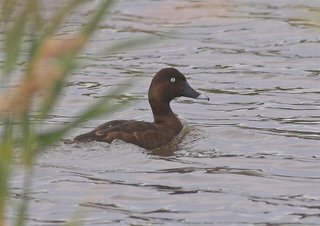 Today (Thursday) was no exception, though we did only see the one bird (accompanying pic), and that a juvenile, as evident by the dull bill. 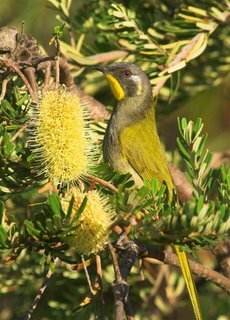 Having failed to get any shots of the Crescent Honeyeater earlier in the week, I went back to Cape Deslacs Reserve (Clifton Beach) this morning to try again. With a bit of luck and perseverence, I finally managed to get some useable shots. 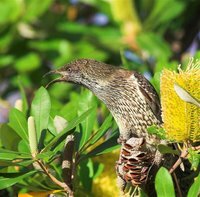 I staked out a couple of Banksias with the hope that eventually one of the males would turn up, and while waiting, a male came and sat on the branch of a eucalypt quite nearby. Sometimes things go my way! Although both male and female Crescents were feeding on Banksia blossom, I noted that both were catching insects too. As the morning wore on, the males spent more time chasing each other, and rarely spent more than a few seconds on the Banksia flowers--time to pack up and hope that the shots are OK. This was one of the few times I had seen so many female Crescents, certainly in my garden they are distinctly rare visitors, whereas the males are common, ( but frequently hassled by the Little Wattlebirds). but failed! 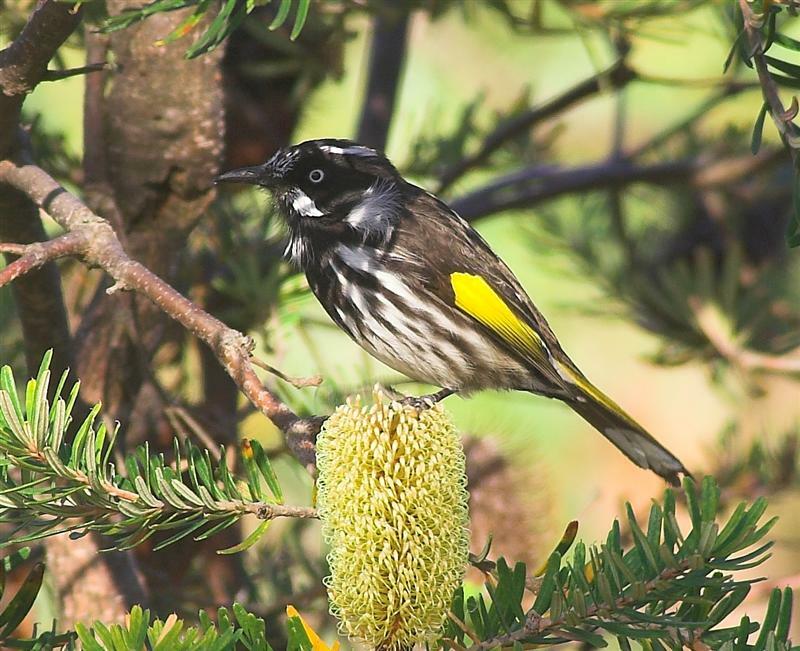 They show New Holland (top right) & Yellow-throated(bottom right) Honeyeaters and a Silvereye. I returned to Clifton today, a still, sunny morning, and much to my surprise I found more Common Bronzewings. 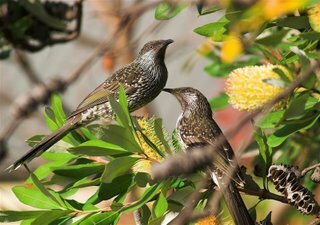 I took the accompanying shots of Bronzewings in someones' front garden, along Bicheno St.. 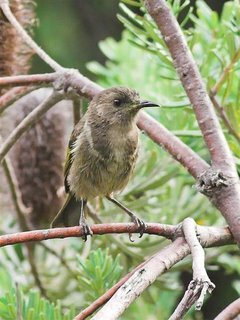 In total there were 8 birds, and very approachable, presumably because they have got used to the to and froing of locals. 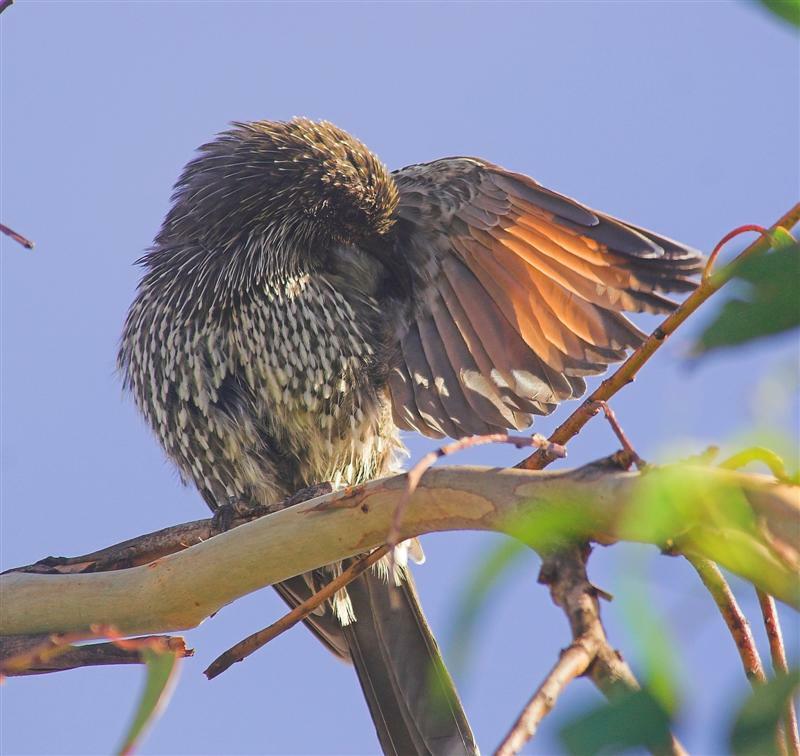 So despite having blogged Bronzewings a few days ago, I thought these shots were worthy of publishing and better show the birds exquisite plumage. This morning was one of those days that I should have stayed in. It was windy, very overcast, and not the sort of day to be birding, and definetly not a day for bird photography. 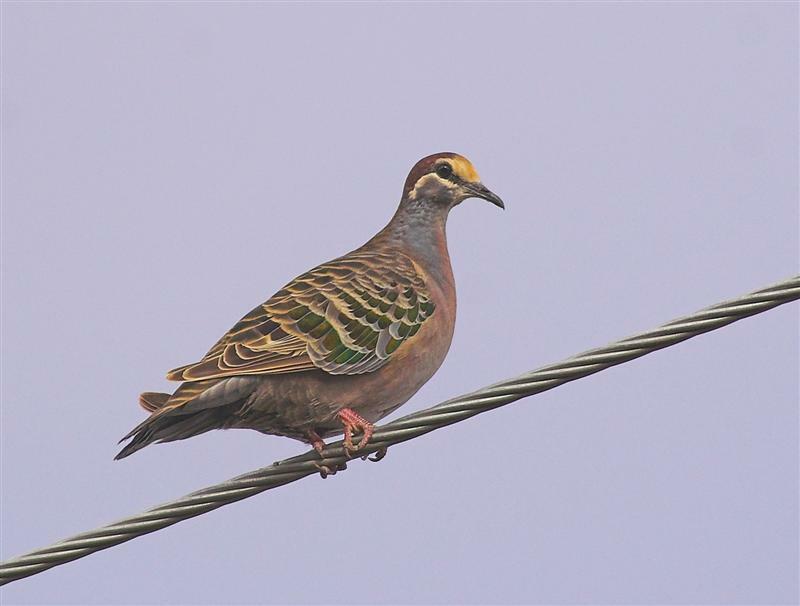 I drove round most of the local traps, and was returning from Pipeclay Lagoon along Clifton Rd., when I noticed what I assumed was a Turtle Dove on the wires. I slowed as I passed for a positive ID, and realised it was a Common Bronzewing--U-turn--time for a couple of pix! I don't get the chance to photograph them that often and although the wire doesn't add anything to the shot, at least I got it. 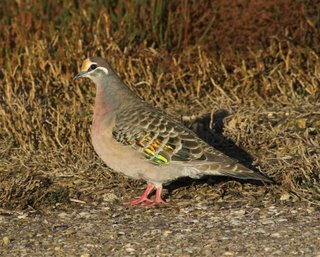 Back in the '70s I regularly birded the South Arm Peninsula, and on one memorable morning, found 8 Common Bronzewing (and 2 Beautiful Firetail) nests. 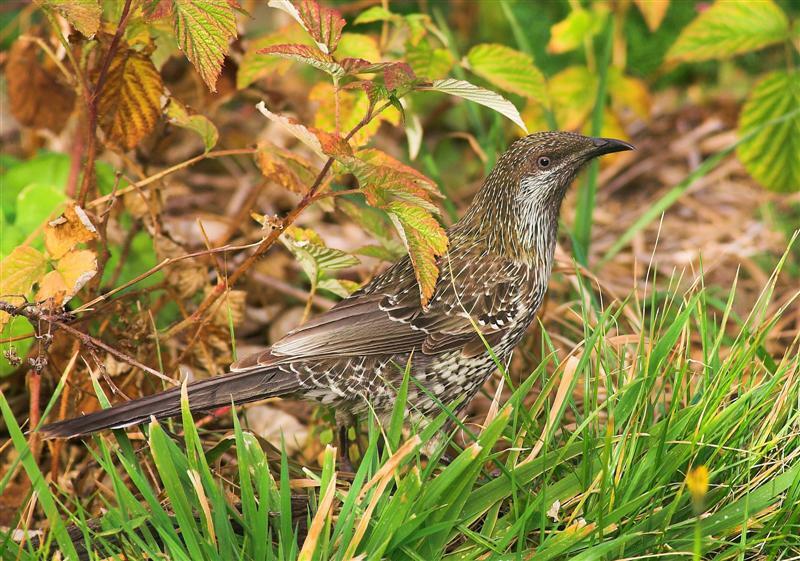 The Bronzewings were amongst the more common birds in the light timbered sandy heath behind Mortimer Bay. 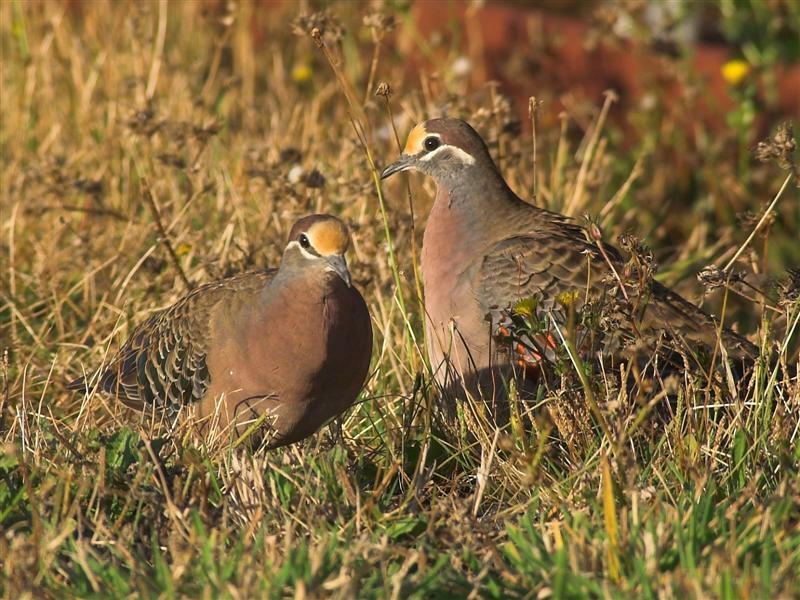 Today, with the area having been sub divided into 5 acre blocks, most of the Bronzewings have gone. At least I still have my memories. I was down at the Peter Murrell Reserve this morning and after a fairly lack lustre morning as far as birding goes, wandered back towards the car park on the Western side of Coffee Creek, a route I had not taken before. As I neared the 2nd pond, there were loud, very agitated calls, that I recognised as a Brown Falcon's. I headed away from the trees hoping to get a view, and possibly photograph, the pair of falcons as they wheeled, calling, just above the trees. 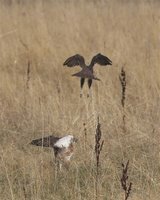 As I did so, I saw another 'Brown', heading towards me across open paddocks. The calls from the wheeling Browns at this stage reached fever pitch! As the interloping Brown approached it was attacked at a speed a Peregrine would have been proud of and certainly much faster than I've ever seen a Brown Falcon fly at. 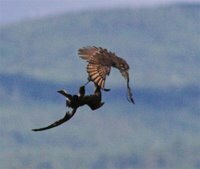 The two falcons locked talons as you can see in the rather poor quality photo., and fell to the ground. They landed in a heap, disentangled, and the interloper flew off. The triumphant bird returned to its' mat e in the trees near the pond. The whole episode had taken a matter of seconds, and I was torn between trying to photograph it and just watching a thrilling event. I did neither well! and the images don't do the event justice, but I did feel as I wandered back, that the morning had proved to be very satisfactory. I hope the photos capture at least some of the excitement. Little Pied and Great Cormorants, Swamphens, Native Hen, Kelp Gulls, Coot and Little Grassbirds. There appears to be good numbers of Shoveller about at the moment, with at least 80 at Granton Reserve and 40 at the Orielton settling ponds. 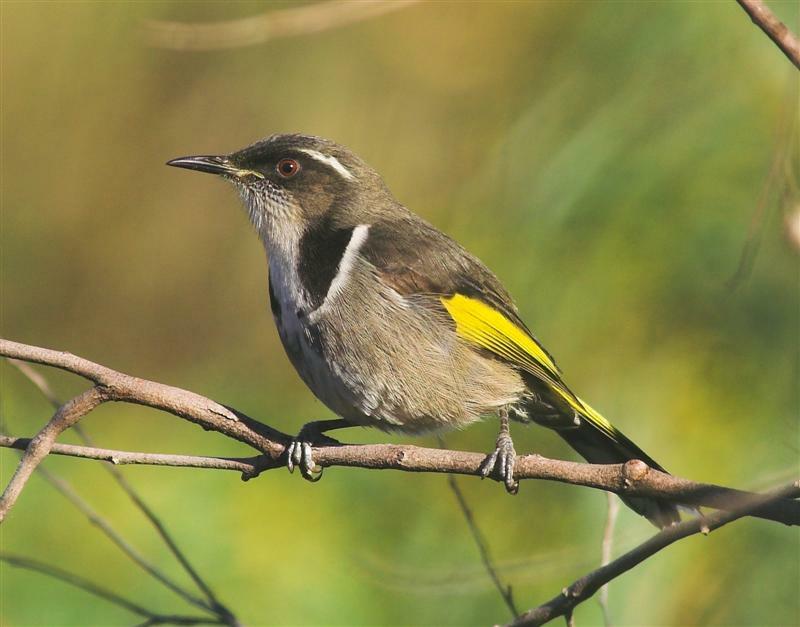 That was the name John Gould called the bird that most of us call simply "Sulphur-crested" and arguably, after the Kookaburra, the most widely known Australian bird. On my recent trip "In Search of Cattle Egrets", the most commonly seen bird was undoubtably these Cockatoos, and when you are looking for white birds in paddocks (egrets), they can make for a frustrating search! Gould mentions the farmers dislike of these birds (he's writing in the 1860s) and comments "it is consequently hunted and shot down wherever it is found, a circumstance which tends to lessen its numbers." One imagines it would!! I found large flocks in the Broadmarsh and Meadowbank area, but the biggest flock appears to be in the Ouse area. I set off from Ouse on the Osterly Rd., looking for egrets, and shortly came across a large 'cloud' of Cockatoos rising above the trees and calling noisily. I assumed they had been disturbed by farming operations, but as I turned back towards Ouse, I saw the 'culprit'--a Wedgetailed Eagle, just close enough to photograph. 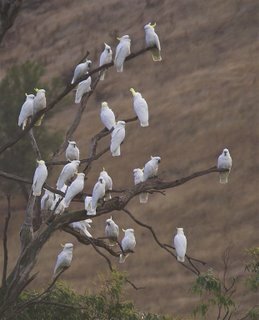 All the Cockatoos stayed in the trees until the Eagle had disappeared into the distance. The flock here appears to number at least 800 birds, and the other 2 flocks mentioned,are in the 2-300 range. Coincidentally, I came across another Wedgie in the Meadowbank area, on the way back. Although I've watched many Wedgetails over the years, I still stop and watch these magnificent flyers whenever possible. 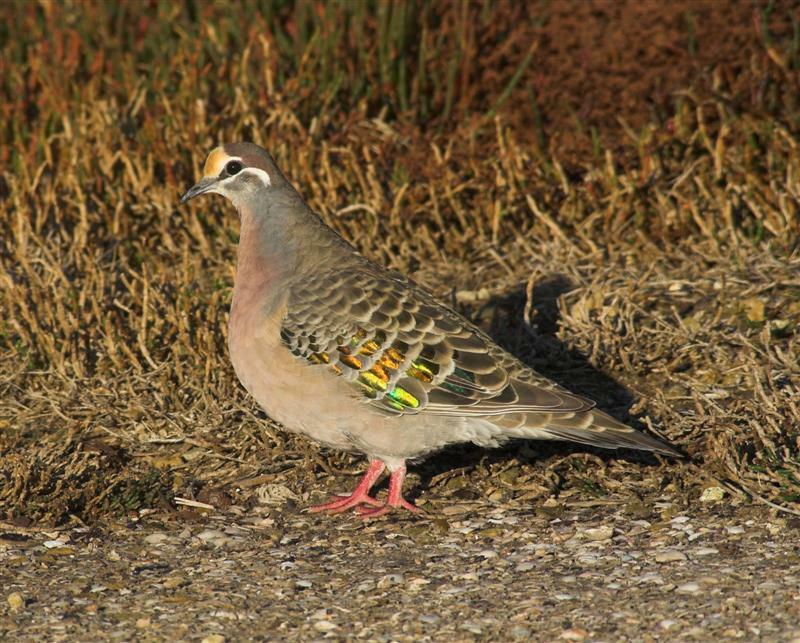 From Bill& Els: Just received an e-mail from a friend on Flinders Island who reports picking up an immature White-headed Pigeon on Palana Beach. Apparently it had some "interesting items" in its' crop, which had been torn open. 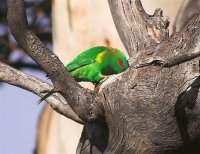 The bird has been lodged with the Queen Vic Museum. 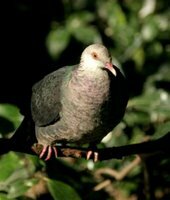 NB The White-headed Pigeon is found along the coastal strip of NSW and Queensland. Bill tells me he took the accompanying pic. 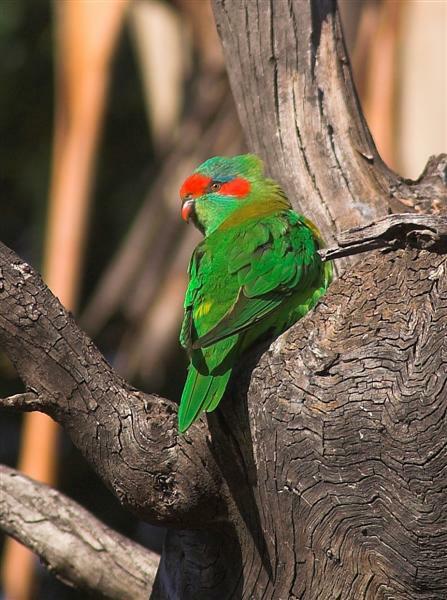 at the Melbourne Zoo. 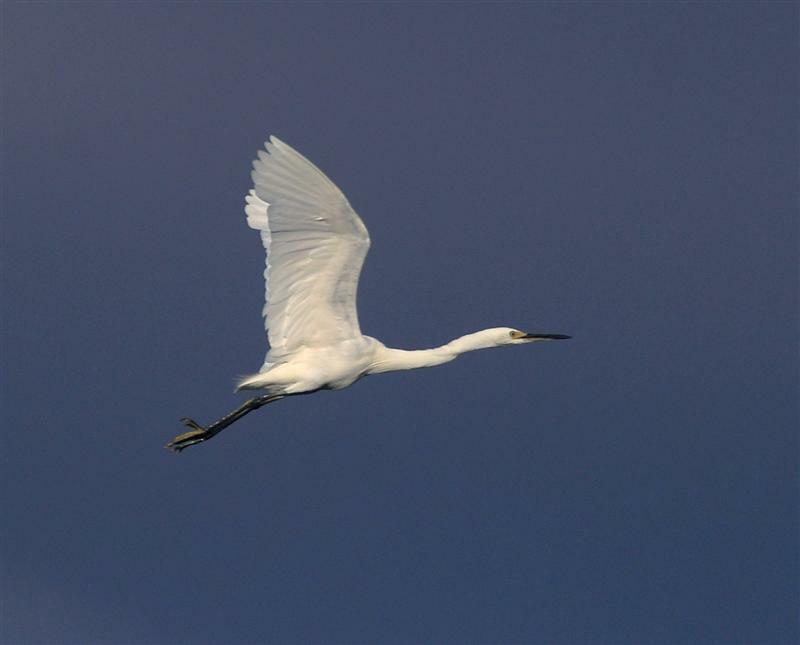 In Search of Cattle Egrets. 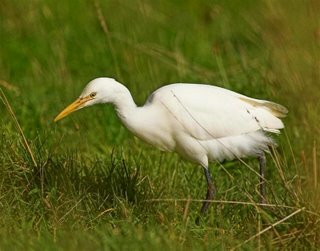 On a cool, if not cold, morning, I went in search of Cattle Egrets. I'd decided on a search of the Broadmarsh area, North of Brighton, as a possible spot and I did indeed find some. Not exactly a lot, I think the total for the entire valley was around 15, divided into 3 flocks. The biggest group of 10, were feeding with horses, another of 3 with cattle and the remaining 2 with sheep. I moved on to Hamilton and Ouse and got a big fat zero! An area that in the past would have had flocks totaling 50+ birds. On the trip back to Hobart, I drove via New Norfolk and there on the outskirts of the town--voila!--20+ Cattle Egrets, this time feeding with cattle--time for photography. 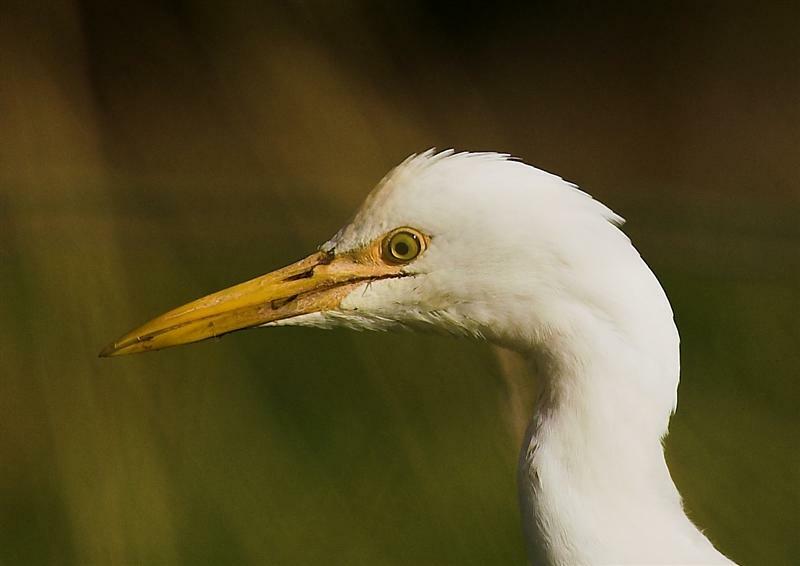 Back at the time of the first Atlas, we confidently predicted, that in a few years, we would be recording Cattle Egrets breeding, certainly on King Island, and most probably in the coastal areas of the North West of Tasmania. I suspect the prolonged drought on the Mainland, has reduced numbers and that we might have to wait a good while longer, although the North of the state still records large Wintering flocks. 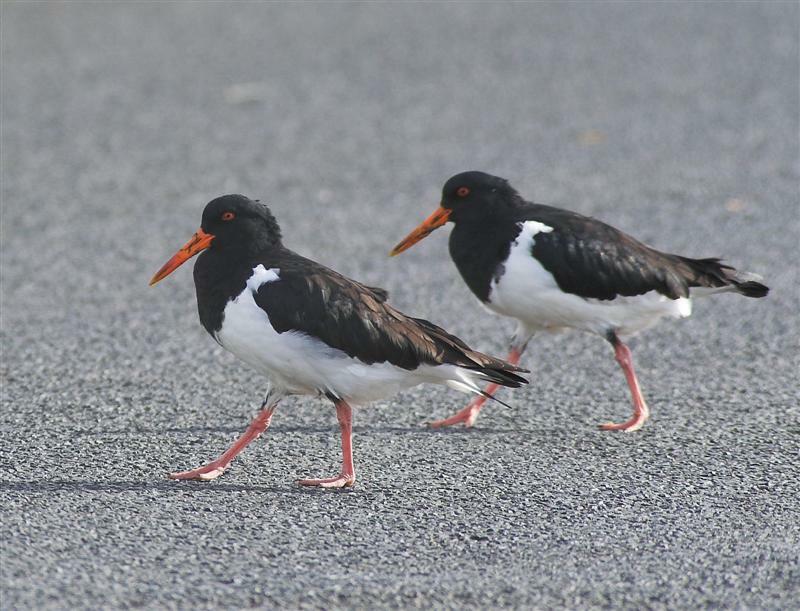 Why did the Oystercatchers cross the road? 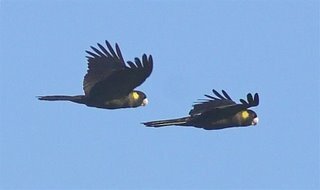 To join the Cockatoos on the other side! Well that's not really why, but a morning excursion which included Montrose Bay, threw up a couple of interesting sights. One was the 50 plus Pied Oystercatchers feeding on the Rosetta High playing fields, prepared to put up with children, pedestrians and traffic to cross the road from their roost site on the shores of the Derwent River. The other was seeing the Oystercatchers feeding alongside the Sulphur-crested Cockatoos. At first I thought that many of the Oystercatchers were juvenile (having a dark tip to their bill), but real ised that this was the result of feeding in wet ground! I imagine for locals this is a common sight, but I found it quite novel. I spend a great deal of time watching Little Wattlebirds in my garden. It's not so much that I do it consciously, more because they're always there. They breed almost the whole year long, and they're very protective of their "patch" and their young. At the moment they have their work cut out, with flocks of Musk Lorikeets on the flowering euc. leucoxylon. But the point of this posting is to recall some strange antics of a LWB recently. 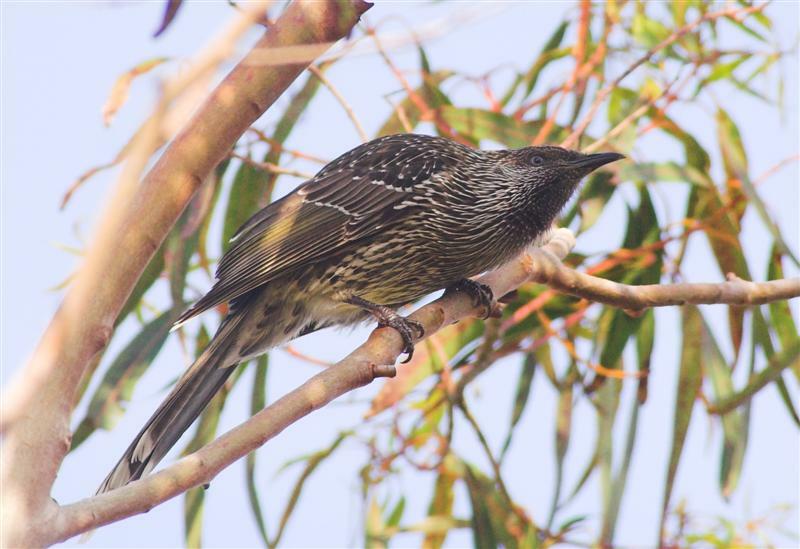 The frequent snapping of its' bill by a LWB drew my attention to it. It sat as per image at left, preening, but obviously catching very small flying insects disturbed from its' plumage as it did so. Shortly after, it flew to the top of a melaleuca and with wings open, dragged itself through the foliage. It then flew back to the original perch and repeated its' earlier performance of catching insects as it preened. I'm not sure whether it was garnering insects to eat in a rather novel way, or using the insects as part of the grooming process. Either way, I don't recall ever see this process in LWBs or any other species. Can anyone shed any light on this behaviour?